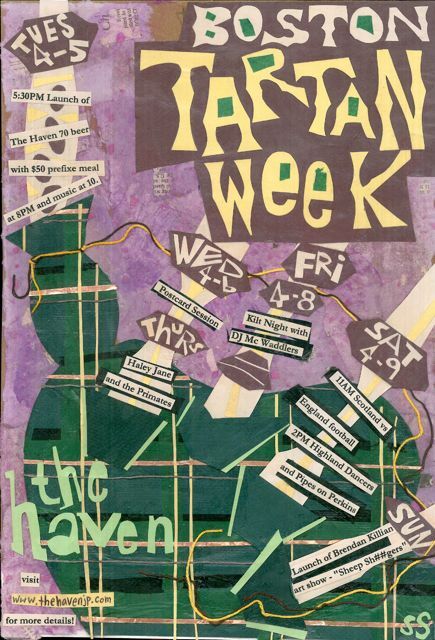 Boston Tartan Week kicks off at The Haven on Monday 4th April thru Sunday April 10th. Monday April 4th: Girls Pint Out host the Scottish Quiz night. Starts at 8.30pm. Free Deep Fried Mars Bar for every team. Tues April 5th: Launch of the Haven Scotch Ale “The 70 shilling special”. Prix Fixe beer dinner followed by Scottish eighties night and a showing of ‘Tunes of Glory”. Thurs April 7th Haley Jane and the Primates kick start their month long residency at The Haven performing some choice eighties Scottish tunes. (if we’re lucky). Fri April 8th : Kilt night. Grab your Plaid and head to The Haven for pipes and free mars bars as well as amazing cuisine. Dj Waddlers spins Scottish classics from 10 – close. Sat April 9th : Scotland v England Olympics start at 2pm. Scotch Egg race, Haggis Hurling, Pint O’Porridge and Tossing the Caber competition. Pipes at 3pm. Come and sample the new Scottish 70 shilling and watch the nonsense! Sun April 10th: “A Home at The Haven”. An art exhibition of Scottish Sheep by local ‘Scottish’ artist Brendan Killian. 4pm start time with yet more tasting of the Scottish 70 shilling. (served in cocktail glasses for full Art show effect). Brendan Killians’s haunting Sheep paintings are ‘Home at The Haven’ till June. Post all your pics of your tartan day festivities to win some fabulous prizes! Read our blog to learn all about our Tartan Day competition.